UNDP and Zhou Xun Team Up for an Environmental Campaign to Promote Sustainable Lifestyle in China BEIJING, March 5 /Xinhua-PRNewswire/ -- United Nations Development Programme (UNDP) and Zhou Xun, a top Chinese actress, are teaming up in an environmental campaign to raise awareness on environmental challenges among the general public, while advocating for lifestyle changes to tackle climate change. Today marks the launch of an online competition to produce the official name and logo for this endeavor. The competition, hosted by Sohu.com ( http://xiaozhou-undp.yule.sohu.com/ ), will allow the general public to help create the innovative image of the green campaign, a joint effort combining UNDP’s international expertise and influence in environmental protection while leveraging Zhou Xun’s star power to make the general public, especially urban youth, aware of the global climate crisis. The campaign will focus on every-day solutions that empower anyone to help turn the tide on global warming. Zhou Xun, the voice of the campaign and a top Chinese celebrity, is committed to helping promote a sustainable lifestyle and mobilize public interest. "The environment is a really popular issue right now and most people know about global warming, but are simply reluctant to change their lifestyle habits," Zhou Xun said. "So I hope this campaign does more than raise awareness - I hope it actually convinces people to act. That’s why I want to send a message that is hip and stylish but also sincere and impactful. Also, our green tips need to be simple and straightforward enough so that anyone and everyone can practice them. So the question is not, ‘Do you know about global warming?’ It’s ‘What are you going to do about global warming?’ That’s the real challenge." "Globally, UNDP uses its local knowledge, network of partners, and experience and expertise on climate change to help millions of people gain a better understanding of the gravity of the issue and help them deal with it and keep it from getting worse," said Subinay Nandy, UNDP Country Director in China. "In China, UNDP helps increase energy efficiency in industry, promotes use of renewable energy, and fosters local capacities to adapt to impacts of climate change on food and water security, glacial melting and natural disasters." "This is, however, the first time that UNDP is to work with a Chinese artist and celebrity as a means to connect to young people and urge them to take individual actions to help tackle global warming. Zhou Xun brings a genuine charisma, as well as bona fide star power. We are very excited to have her on board, and we know that her credibility and commitment to environmental sustainability will help us reach more people and achieve higher levels of success," Nandy added. The online logo and name competitions will last for one month until 4 April. Fifteen participant prizes, five honorable mention prizes, and one first place prize will be awarded in each of the two competition categories. All winners will receive a thank you letter signed by Zhou Xun and UNDP and limited edition gifts designed by Zhou Xun. The first-place winners will also have chance to attend a press conference to kick off the green campaign and meet Zhou Xun personally. The selected name and logo will also be unveiled during the event. Participants are asked to submit works that embody the spirit and theme of a proactive green campaign that advocates sustainable living while keeping in line with Zhou Xun’s public image as a fashionable, sincere, and hip Chinese celebrity. 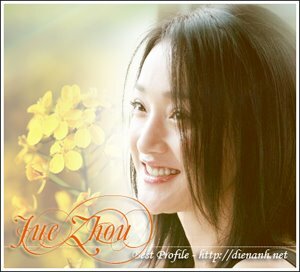 For further details on the competition, please go to: xiaozhou-undp.yule.sohu.com About Zhou Xun: Zhou Xun is an award-winning actress, singer, and fashion icon. Notable film roles include SUZHOU RIVER (1998): Best Actress, 15th Paris Film Festival; PERHAPS LOVE (2005): Best Actress, Hong Kong Film Critic’s Society Awards, 25th Hong Kong Film Awards, 13th Beijing University Student Film Festival, Golden Bauhinia Awards, 43rd Golden Horse Awards; THE BANQUET (2005): Best Supporting Actress, 26th Hong Kong Film Awards, 12th Golden Bauhinia Awards, and others. Aside from acting, her other passion is charity work. She is the sponsor of several students at Dazu Primary School in Hulugu Lake, Sichuan Province. She is also an enthusiastic supporter of the Beijing Sun Village Center for Special Needs Children, a home for abandoned children of prisoners. Zhou Xun is one of the first lifetime members of the Jet Li One Foundation, which focuses on natural disaster relief and adolescent mental illness. About UNDP: UNDP fosters human development to empower women and men to build better lives in China. As the UN’s development network, UNDP draws on a world of experience to assist China in developing its own solutions to the country’s development challenges. Through partnerships and innovation, UNDP works to achieve the Millennium Development Goals and an equitable Xiao Kang society by reducing poverty, strengthening the rule of law, promoting environmental sustainability, and fighting HIV/AIDS.